The Nissan Juke, a mini SUV released to the market in 2010, is being promoted in Canada as the Urban Legend. Due to restrictions by the Advertising Standards Canada, which bans depictions of unsafe driving in TV commercials, advertisers have had to find creative ways to show off their high-performance vehicles. However, advertisers are able to show unsafe driving as long as it’s clearly fake, which is where the idea for an animated series came from. 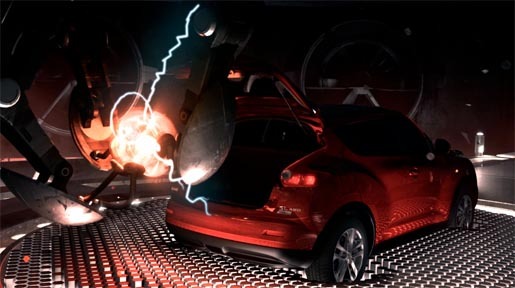 The three-part series of television commercials explores special engineering and design innovations on the Juke. “Dread” focused on the 188 horse power engine. “Weather” focuses on the all-wheel drive system. The third commercial, “Trophy”, shows a woman and The Juke taking on a futuristic gang of bikers in style. What makes an Urban Legend? Saving a city from total destruction would be enough, but only if you do it in style, like the Nissan Juke. The Urban Legend campaign was developed at TBWA\Toronto by chief creative officer Jack Neary, creative director/art director Mark Mason, creative directors Allen Oke and James Ansley, copywriter Graeme Campbell, art director Cliff Seto, agency producers Nadya MacNeill and Lindsay Hutchison, group account director Richard Phillips, account director Trevor Byrne. The commercials were produced at Psyop by creative director Laurent Ledru. Visual effects were produced at MassMarket by executive producer Christine Schneider, producer Leighton Greer, VFX supervisor Kyle Cassidy, animation supervisor Dan Vislocky, previs supervisor Matt Connolly, composite supervisor Shahana Kahn, modeling supervisor Andy Kim, matte painting supervisor Matt Conway.